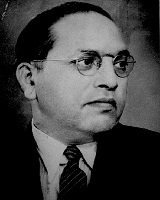 Dr Bhimrao Ambedkar 14 April 1891 6 December 1956 Indian Ramji Maloji Sakpal Bhimabai Sakpal Public Speaker, Social Reformer, Historian, Politician, Jurist, Anthropologist, Writer, Philosopher, Economist An Indian jurist, economist, politician and social reformer who inspired the Dalit Buddhist movement, supporting the rights of women and labour. First Independent India's law minister and the principal architect of the Constitution of India. A list of popular Hindi Dr Bhimrao Ambedkar quotes are given below.